This meal contains a wide range of vitamins and minerals and has a good calcium content from the fish. The oils provide long chain omega-6 fatty acids and the snapper is a semi-oily fish containing vital omega-3 fats. Heat a grill or griddle pan over a high heat. Brush with the groundnut oil, and when hot, grill the fish fillets for 3-4 minutes, turning once, or till cooked all the way through but still moist. Meanwhile, cook the noodles according to packet instructions. At the same time, steam the mangetout and carrot for 4-5 minutes in a steamer or metal sieve over a pan of boiling water. Toss the steamed vegetables in the sesame oil. Drain the noodles well and toss with the chillies, onions, coriander and lime juice. 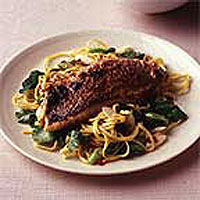 Serve the noodles, topped with the fish, with a side dish of the vegetables sprinkled with the sesame seeds (if using) and a little salt. Breakfast: Bio yogurt with cantaloupe melon and black grapes. Protein: 40g; Carbohydrate: 52.5g; Fibre: 5g.